We talk a lot of IP cameras in our blog, but there’s one thing IP cameras can’t see: heat. Or, more specifically, they can’t see the variations in temperature in the environment. This is because IP cameras operate in the visible light spectrum. Thermal cameras, on the other hand, operate in the infrared spectrum, which means instead of looking at the visible features of the environment, thermal cameras focus its temperature characteristics. So what does this mean for perimeter security? In short, it means that it’s a lot harder for any potential intruder to go unnoticed. Learn more about how thermal cameras improve perimeter security in our blog. What are the advantages of thermal cameras? While intruders can hide in the dark of the night, they can’t hide their heat signature. 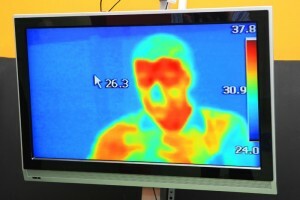 Humans give off a heat signature that is plain to see on a thermal camera. Other methods of perimeter security, such as a perimeter fence, are not very discreet. Thermal cameras offer a discreet method of security that doesn’t give itself away, yet will give intruders away every time. Most thermal cameras are built on open platform standards, which means they’re compatible with in-camera third-party applications that can improve their functionality. One example of this is proactive detection and tracking software. When the thermal camera registers an anomalous heat signature that could be an intruder, it proceeds to take several steps. It transmits the location of the heat signature to an IP camera, which can get a visual on the target. The software can also alert security personnel of the threat via an alert sent to their mobile device, with real-time tracking updates. For a long time, detection of intruders at long range required a cameras with a larger lens. The field of view on these cameras was narrowed as a consequence of the larger lens. But now, new in-camera software can allow the thermal camera to detect and track an object at range using only a few pixels, which allows the camera to maintain a larger field of view. Because third-party software lives in the camera instead of on a server, it reduces the bandwidth consumption, which reduces storage requirements. This saves spaces and reduces operational costs. This entry was posted on Thursday, July 9th, 2015 at 1:06 pm. Both comments and pings are currently closed.